This was going to be a post about writing. The next post probably will be, but this time I’m going to take a minute out of being in writerly mode to share one of the most beautiful creations ever made by man. Tiaras aren’t everyone’s cup of tea, I know, but I adore them. They’re frivolous and cruelly expensive bits of frippery, and yes, I know that in today’s earnest, take-issues-seriously world, I should be concerning myself with gay rights or ending hunger and oppression–and believe me, most days I do just that–but just once in a while I want to be frivolous too. Tiaras are amongst the loveliest of adornments which, when they catch the light, scintillate shamelessly (in Geoffrey Munn’s immortal phrase). They’re just beautiful. 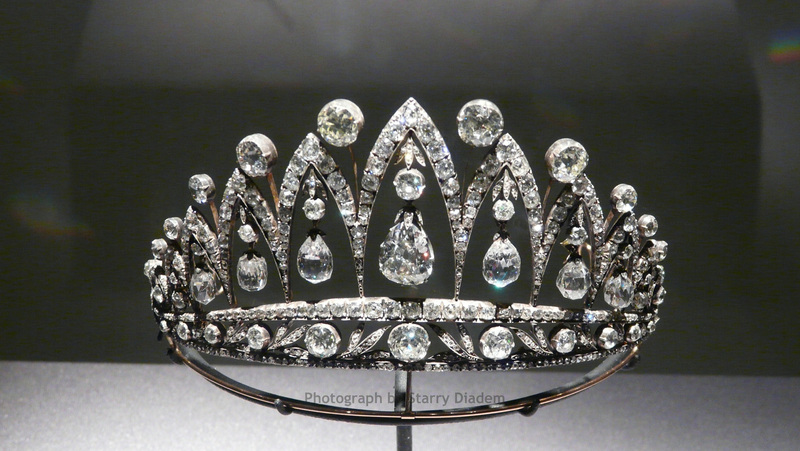 This isn’t my favourite tiara (that’s the Hunt and Roskill diamond oakleaf and acorn tiara in the British Museum) but I certainly wouldn’t object if Mr Butler took it into his head to acquire several millions of pounds so he could drop it into my lap. 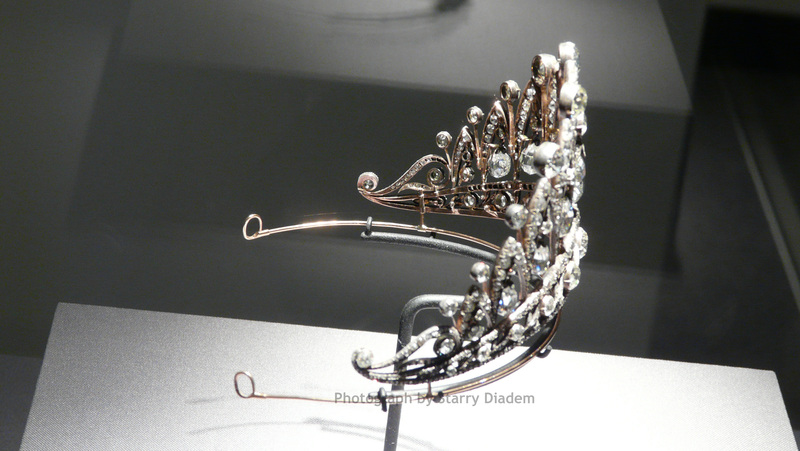 Imagine my delight when I discovered the tiara, along with dozens of other Fabergé items, is on permanent display at the Houston Museum of Natural Sciences. Is it any wonder that I was so keen to go to Galacticon3 to do that writing workshop?! 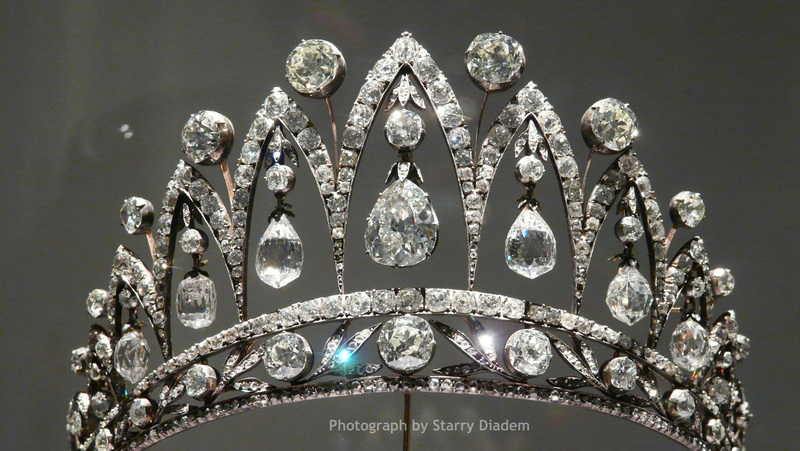 There are not many Fabergé tiaras in existence. This one, only 5.2″ wide, is known as the Empress Josephine tiara or sometimes the Leuchtenberg tiara, but as it was made by Fabergé’s workmaster August Holmström in 1890 and the Empress died in 1814, it was certainly never hers. However, some of the diamonds were. The briolette-cut (i.e. drop-shaped) diamonds in the tiara were a gift from Emperor Alexander I of Russia to Josephine when he visited La Malmaison following her divorce from Napoleon, perhaps as a part-payment for an important collection of old master paintings which the Emperor acquired from her and is still in the Hermitage today. The Leuchtenberg title was given to Eugène de Beauhamais, the son of the Empress Josephine and the adopted stepson of Napoleon, when Eugène married Princess Augusta of Bavaria. Their youngest son married the eldest daughter of Emperor Nicholas I, which explains why diamonds given by an Emperor of Russia to the Empress Josephine of France, ended up in the tiara of a Russian princess married to a German prince. 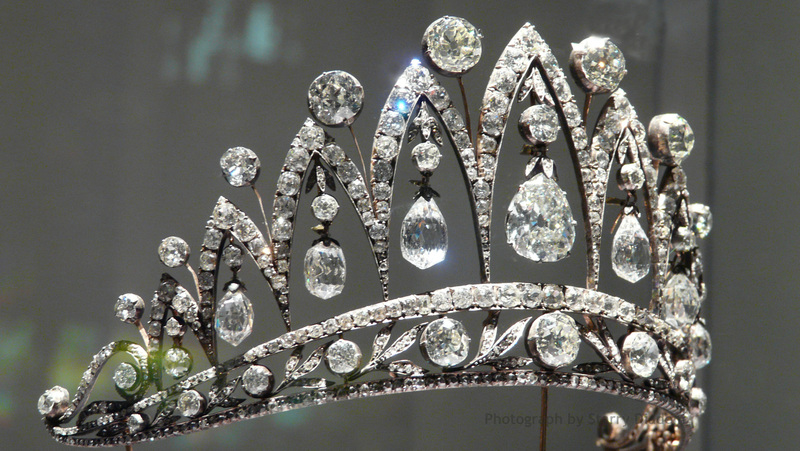 The Leuchtenberg family sold the tiara during WWI, and it was bought by the Belgium royal family. When Queen Elisabeth of Belgium died in 1965, her son Prince Charles Theodore (1903-83) inherited it. The tiara then passed to his sister, Queen Maria José (1906-2001) the last Queen of Italy. Princess Maria Gabriella, her daughter, inherited the tiara in 2001 and put it up for auction in 2007. I wish they’d thought of me when they were doing that. Tch. So there you are. The potted history of a glorious work of art. If ever you go to Houston, don’t miss it. Previous Fanfiction – and why it’s a good, good thing. 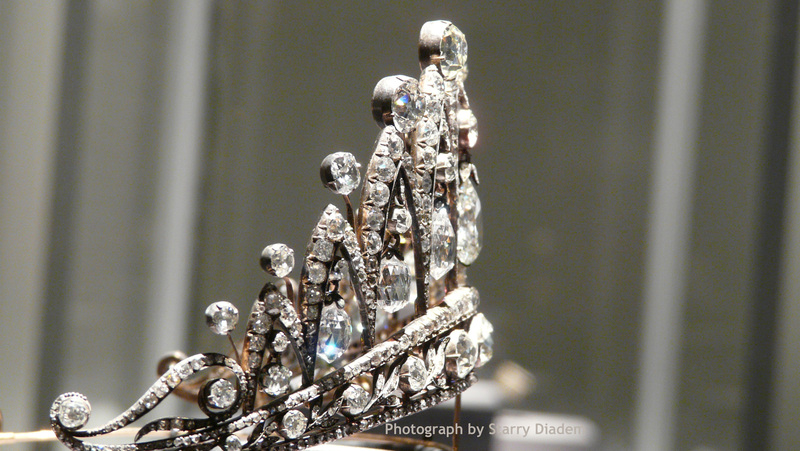 I love how well you really know your history–and tiaras! I hope you cross posted these to Pinterest because people will love seeing them there too!